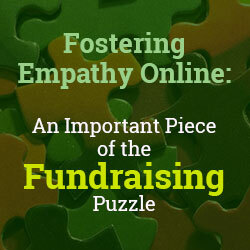 Fostering empathy and connecting with donors online has the potential to influence giving and build long-term relationships and support – results any nonprofit would value. Unfortunately, many of them simply don’t have the time or resources to investigate the best ways to use social media and online resources within their organizations. As a result, marketing and development teams often continue to focus heavily on attracting and engaging donors using traditional fundraising models, which can lead to a frustrating disconnect with donors and less-than-stellar fundraising results. However, nonprofits that have taken the plunge into online outreach are seeing increased donor engagement via social media channels, influencer networks and digital-centric campaigns. They’ve also benefitted from tapping the expertise of interactive agencies to improve their online giving outcomes. The good news is that there’s a huge array of online tools and channels available to help nonprofits connect with their audiences successfully. If you’re about to dive into social media, here are a few tactics that can make your efforts more successful and rewarding. According to a Cygnus Applied Research survey, 61% of donors would prefer both to receive communications and to give exclusively online. However, 49% said they’re likely to donate less if they feel over solicited. Knowing and respecting these preferences helps you not just connect with new donors, but make sure they become long-term allies. First, take a moment to think about your audience. Where they are spending time online, and when? Are you trying to reach moms? Dads? Young adults? CSR directors and other professionals? What are their habits, on and offline? Thanks to the increased amount of time that consumers are spending online and on their mobile devices, nonprofits can access much of the data about their behaviors, preferences, transactions and affiliations. Turning that information into actionable insights can help inform a development team’s specific stewardship and engagement strategies, and can be used to tailor marketing messages to different donor segments online. After you’ve identified your audience, it’s time to engage, remembering that not all donors are attracted by exactly the same marketing messages. Like any relationship, social engagement is a give-and-take proposition. Liking, sharing and retweeting others’ posts and activities online is always encouraged – but it’s also wise to have a proactive social strategy that appeals to multiple donor segments and generations. For instance, outreach that grabs the attention of Millennials may or may not speak to Baby Boomers or Gen X’ers. Similarly, write your marketing materials with different platforms in mind: a blog post describing your nonprofit’s current fundraiser should also be shared widely across multiple platforms such as Facebook and LinkedIn. Another useful tool for building donor engagement is crowdfunding – especially platforms that enable you to publish a campaign quickly and easily. IndieGogo, Tilt, Classy and 121Giving are all examples that are being used successfully by nonprofits in different categories. In 2014 alone, crowdfunding campaigns raised $10 billion worldwide, making them an invaluable approach for nonprofits with time-sensitive fundraising goals. Most of these platforms allow nonprofits to create a branded online environment with a landing page for engaging with donors. By posting updates, videos and comments on this page, nonprofits can engage supporters as involved partners, asking them to help fulfill the organization’s mission – rather than treating them as bystanders who have little say in where their donation dollars are going. If you decide to go down the crowdfunding path, appoint a dedicated manager within your organization to help guide these campaigns for success. Crowdfunding requires preparation, monitoring and follow-up to make the most of the opportunity – but the results can be well worth the effort. When you’re ready to kick off your campaign, create a hashtag for your fundraiser. This is a great way to aggregate tweets from multiple sources and to make it easy for donors and supporters to find vital information (e.g., where to donate). Before running with that hashtag, though, make sure you’ve researched it to be sure it’s original and strikes the right tone. The last thing you want is something that’s out of context, contains slang, offensive or off-color material, or tags someone else’s content. Developing a Twitter chat about the campaign can also increase awareness and engagement – and significantly grow your following. One of the easiest ways to ensure a successful campaign is to recruit social ambassadors for your organization. For example, at 121Giving we created a Social Impact Boss program to encourage donors to share information about current fundraising campaigns on our website. Donors can sign up to receive email notifications when causes they support launch campaigns, along with regular updates. Create tweets and Facebook posts about each campaign, and make them available to your organization’s members (and newsletter subscribers) so they can help socialize your cause. Identify all possible social ambassadors and appoint an eager volunteer as the group’s lead. Designating a social leader outside of your organization lets others take ownership and assume responsibility for helping your nonprofit reach its fundraising goals. Others want to help, and you don’t have do it alone! Social media is much more than a tool; it’s a necessary piece of your marketing strategy that offers a significant opportunity not only to increase donations through online channels, but to attract long-term sponsorship dollars. Creating an online presence that targets key players, developing a social strategy, creating social ambassador programs and using social media to promote crowdfunding campaigns are all efforts that, if properly executed, can deliver outstanding results with significantly less resources than traditional fundraising models. Liz Deering is a social entrepreneur whose career love for start-ups took root early when she joined Boston-based Picasa while earning a master’s degree in graphic design. She then spent more than 15 years in marketing, interactive technologies and account management positions at both category-disrupting startups and traditional nonprofit organizations --- experiences that fueled her passion to launch Austin-based 121Giving, an online crowdfunding platform that links nonprofit, donors and socially conscious companies.